FULTON, NY – 22 scarecrows can be found scattered around downtown Fulton. City employee of 16 years for the Department of Parks and Recreation, Ronica Sivers took the initiative to bring a little fall festivity to the city of Fulton. For a week, Sivers and her co-worker Kim Burdick built 22 scarecrows fit with themes for strategic placement throughout the city’s downtown. A firefighter scarecrow was placed outside of Fulton Fire Department, a sheriff and judge can be found in front of the Municipal Building, and a nurse and child stand together outside of River View Pediatrics, among many others. The fun started with just one scarecrow four years ago. “Each year it’s just grown bigger and bigger,” she said, the original idea coming from her belief that the city needed a little livening up. Together, the pair said they keep putting the scarecrows up each year because they simply enjoy it. “We just love doing it. When we get to see people’s reaction to them, kids and the elderly especially, it really keeps us going,” Sivers said. Sivers and Burdick have so much fun, they even name all of the scarecrows. 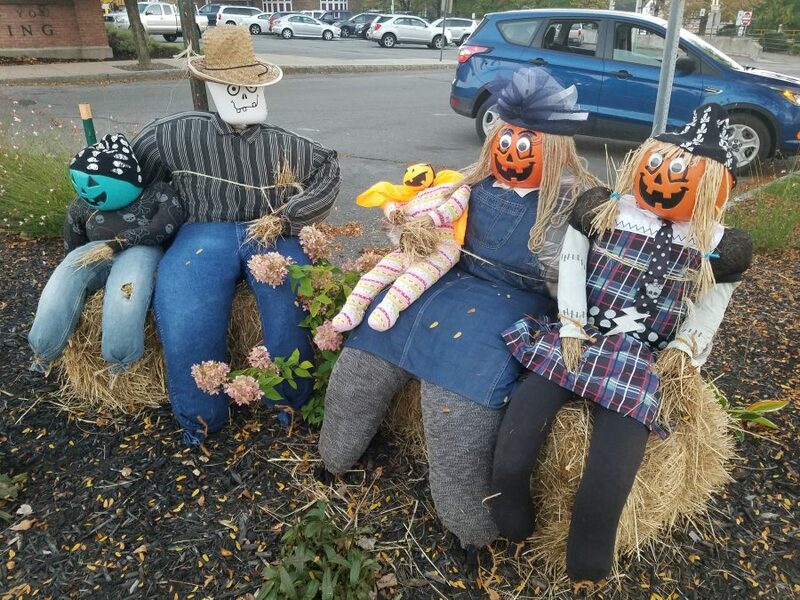 An entire scarecrow family welcomes people to the city’s downtown at the corner of Oneida and South First streets with the rest scattered among the local businesses in the area and even some by the marina on the Oswego River. Though only encompassing the downtown region, the pair is hopeful to extend their scarecrow placement to Bullhead Point, Indian Point, and in city parks. They encourage businesses in the area to contact the Parks and Recreation Department to make a request if they desire a themed scarecrow. “I think its admirable that our city employees want to help improve the city, they are among many who do. We have wonderful employees and volunteer groups doing a great job for our city,” said Fulton Mayor Ronald Woodward Sr. They look very nice and something this subtle has livened up the downtown area a bit. Thanks for doing this ladies. Love reading positive articles in our local news. Thank you once again Ronica and Kim for your continued interest in making the scarecrows part of the city environment.I yelled out the window last week as the two of you were setting them up.I have long admired your work ethic! i drove past the scarecrow in front of the police department late at night and i thought it was a person about to walk in the road in front of me. i about crapped my britches. sure gave me a scare, scarecrow! She does an amazing job every year. We did miss her the one year she was not in the area. Glad to have her back.